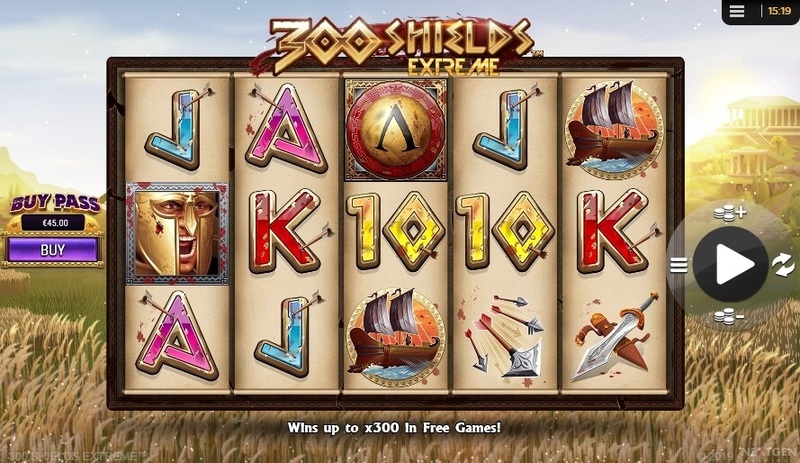 NextGen Gaming is preparing to release the sequel for the popular slot 300 Shields. The new one will be named 300 Shields Extreme, and it is more or less very similar to the old one but with a new feature and some smooth gameplay, as we know that the old one was a little bit to slow when the reels started to spin. As you might have noticed in the above screenshot, in 300 Shields Extreme players will have the opportunity to buy the bonus feature. This feature will cost 60x the bet size and it will automatically award the player with the popular 300 Shields free spins where if lucky, the player can go up to the 3rd level where the wins that connect with a wild symbol are worth 300x more than in a normal spin. 300 Shields Extreme slot has 5 reel, 25 paylines and can be played on all devices with bet sizes from 0.25€ to 12.50€ per spin. Yes, the maximum bet size seems a little low, but as we know by now, the potential of this slot game is over 17.000x the bet size in a single spin, which means that at a 12.5€ bet size the maximum potential win is over 200.000€. The new design looks much better in the new html5 format, which is a slot standard these days, and the players who like the old version will love the new design as well as the graphics and how smooth it looks during the gameplay compared to the old version. There are 2 ways to start the free spins bonus round. One is by buying the feature at the price of 60x the bet size, and the other one is the normal way where players have to land 3 or more scatter symbols on the reels during a spin. The free spins feature will award 5 free spins at the start, and during the free spins players have to collect shields to level up and get more free spins.Also if a player lands 3 shields in a single spin, he will be awarded another 5 free spins in the current level he is on. 2 shields - Collecting 2 shields during the free spins will award a second level of 5 free spins with all wild connecting wins multiplied by 5x. 6 shields - Collecting 6 shields during the free spins will award a third level of 5 free spins with all wild connecting wins multiplied by 25x. 12 shields - Collecting 12 shields during the free spins will award the final level of 5 free spins with all wild connecting wins multiplied by 300x. Of course, every player wants to get at the final level where the potential win is 17.770x the bet size on a single spin. 300 Shields Extreme is a High Volatility slot and has a 95.299% RTP with Maximum win potential per spin of 17,770x. The release date is not yet known.